Thank you for your willingness to should the burden of leadership, and for your commitment to our beautiful state. It’s an honor to have the opportunity to work with you in service to the people of Connecticut. Now that election season is over, we now have the chance to unite to pursue policies that will restore prosperity and help our state thrive. The challenges Connecticut confronts are substantial, and it will certainly require our collective best efforts to surmount them. As you know, Connecticut absorbed a pair of massive tax increases in 2011 and 2015. They have inhibited Connecticut’s recovery from the Great Recession; driven many of our most affluent taxpayers from the state; and made Connecticut less attractive to new enterprises and businesses of long and storied tenure alike. Yet even as taxes have increased, pensions and other retirement-benefit costs for government workers — the key drivers of the state budget crisis — have remained unreformed. And just last year, the state formalized a SEBAC agreement that, on its face, constrains its options for managing forthcoming budget shortfalls. And so you, our leaders, will be facing agonizing decisions as you deliberate over Connecticut’s path forward. What follows in Yankee Institute’s contribution to that crucial discussion. The Charter for Change is a compendium — thorough, we hope, but certainly not comprehensive — of reforms that can begin to turn our state around. These reforms require no changes whatsoever to the SEBAC agreement, and can therefore be enacted through the new governor’s first budget along with its supporting statutory instruments. 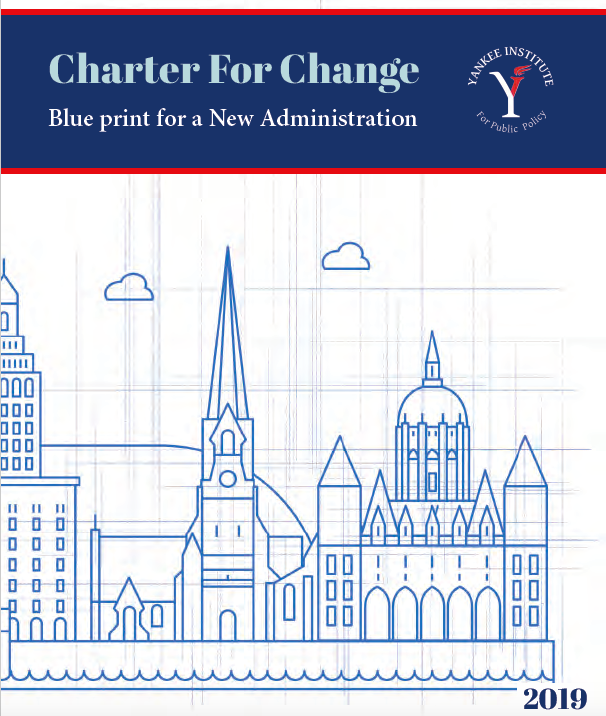 The proposals laid out in the Charter for Change include suggestions on how we can improve the state’s budgeting process, reform municipal funding, streamline state regulation, and more. These are common-sense measures aimed at revitalizing our state’s economy, balancing its books and reinvigorating its body politic. It is time — it is past time — for the meaningful reform our state and its people desperately need. Until Connecticut’s government-worker pension and benefit funding crisis is addressed without further damage to the state’s economy, it is irresponsible and wrong to demand further sacrifices from our already-overburdened taxpayers. Without reform, every revenue increase is effectively swept away by the torrent of unsustainable, endless spending that is bankrupting our state, extinguishing its prospects, and hurting its people. In short, Yankee Institute cannot support any net tax increase of any kind until the hard work of major structural reform has been accomplished. Until government shows itself willing and able to adapt to fiscal reality; resist the coercion of powerful special interests that have long benefited from the status quo; and prioritize private sector growth and opportunity over government expansion, the Yankee Institute mantra will remain clear and unequivocal: Not One Cent More. The task before you may not be easy, but it is necessary as never before. Together, let us begin the work of reform, so that we may someday have the satisfaction of knowing that we did our part, in our time, to restore prosperity for our state and opportunity for its people.